As a quick aside before I get to my main topic, there has been a lot of discussion over the last week or so about the female character models in Wildstar. I tend to agree that they are rather disappointing, but there are a number of better posts on the topic than I am prepared to make today. Liore made one on her blog, and I saw this post and this other post that both speak about the issues involved reasonably well. Several of my friends (who were previously pretty excited about the game) are now having second thoughts about it, and that’s terribly disappointing. Not only because I would like to be able to play what appears to be a fun game with my friends, but also because having to constantly deal with artists’ choices that make people feel uncomfortable playing their games is really tiring. There are so many kinds of people in the world, and these games are so good at customization in other ways, that it just seems ridiculous to have everyone look the same all the time. So I finally hit level 90 with a character in WoW over the weekend. 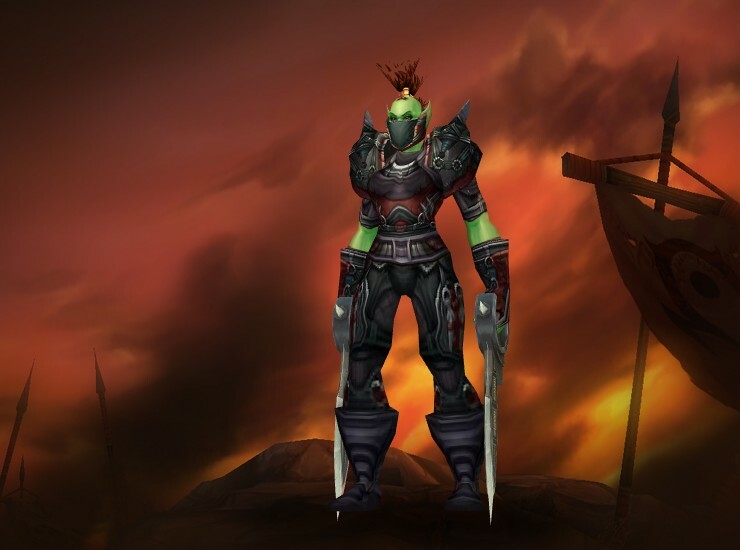 I ended up picking my rogue as the character I’d go with for several reasons – specifically, I wasn’t sure how I would feel about re-opening the Ellyndrial/raiding-character box, which still feels a bit like an open wound – and I’m pretty glad I did. I had taken Katla (a female dwarf, because they are awesome and underrepresented) up to 85 in Cataclysm and gone through LFR, some normal mode raiding, and the early Legendary rogue quest steps. My friend Djoshe really helped me get a lot better at stabbing things, and I’d developed a pretty strong affection for the intricacies of Subtlety. It was the closest thing to the complicated WotLK Feral rotation that I’d played – plus I got to see my armor while doing it! So, yeah, obviously I picked an Orc female character. They are awesome, and have long been a favorite of mine. I’m annoyed that I’ve only found fist weapons so far and thus have to play Combat, but whatever, they’ll come. So, what do you do when you hit 90 nowadays? It turns out that you skip all the rest of the quests, go to Kun-Lai summit, talk to a giant white tiger thing to unlock Vale of Eternal Blossoms, where you learn to fly, go talk to Chromie, and get sent to Timeless Isle. Timeless Isle, a place with so many nicknames and EVEN MORE loot. It’s a bit silly, really. I’m doing my best to ignore the various maps that exist – or, worse, the TomTom waypoint list that just puts an arrow to NEXT PIECE OF LOOT in the middle of your screen – since the place is intended to reward you for exploration. Which is pretty cool, honestly. When I first got there, there are a few quests to ride around the island and check out the various places. While doing that, I came across a few different Rare spawns that I helped kill (they’ve changed everything there to shared tagging, so you only need to participate in a kill to get quest credit and LOOT), found a cave with a pseudo-quest to help out Zarhym’s spirit and get some more SWEET LOOT along the way. I also found a couple of the chests, which literally just have a BoA item that you can click to get some epic gear for whatever your current spec is. So, yeah, Lootbag Timeless Isle is a great way to get some gear when you hit 90. But as a first-time 90, I’m not sure if I love it or not. Sure, it’ll help me get into LFR and Flex raiding and get all of the various achievements related with those this expansion, but it basically cuts out any need at all to go run dungeons or scenarios (I think those are the 3-man things) or finish up any of the regular questing zones. I’m not sure I really like that. I do know that I’d probably be frustrated if I had to spend 6 months gearing up and then LFRing each of the previous raids in turn for 4-6 weeks, but going from level 90-killing-everything seems like it ought to at least have a nod to the other content somewhere. Maybe I’m just being sad that, now that I like Pandaria, I didn’t play it from the beginning. And I’m a big proponent of there being some flavor of catch-up mechanic. Plus, it’s still fun to do. It just all feels like it’s being invalidated too quickly, and while, yeah, I’m still trying to check out the instances/heroics/scenarios/etc, I feel like I’m using a single flight over Europe as proof of my vast knowledge of the continent. But, hey, at least I get free LOOT!